This month, the Bureau of Labor Statistics released the August jobs report. The new numbers were mostly positive, with employers reporting net job growth of 151,000 for the month. However, one disturbing aspect of the report should be the relatively high rate of long-term unemployment. While the percentage of jobless workers unemployed 27 weeks and longer has been trending downward in recent years, it is still exceptionally high by historical standards. 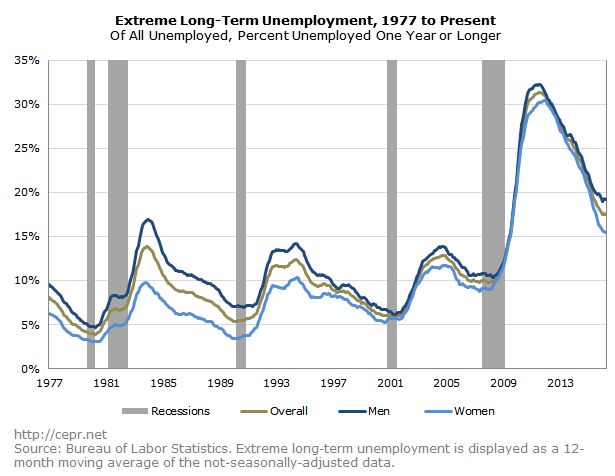 Even more disturbing is the relatively high rate of “extreme” long-term unemployment, the condition of being unemployed one year or longer. The figure below shows extreme long-term unemployment as a percentage of total unemployment from May 1977 to present. Currently there are over 1.3 million Americans who have been out of work for over a year. This is important for two reasons. First, it tells us that unemployed workers today are suffering far more than they did in the past. If spells of unemployment are short and don’t substantially decrease a worker’s standard of living, unemployment may not actually inflict much harm on those who experience it; but if spells of unemployment are long and are associated with substantial drops in income, they can be devastating for the unemployed. In both 2006 and 2007, the average duration of unemployment was 17.9 weeks; as of last month, the average unemployment spell was more than 50 percent longer at 27.6 weeks. And because most of the long-term unemployed are no longer eligible for unemployment insurance, they have to get by without any public support . Second, today’s long-term unemployment may pose a risk to future economic growth. Labor market economists worry about a phenomenon known as “hysteresis” in which long stints of unemployment permanently decrease a worker’s chances of getting hired . There is evidence that this is going on right now, with the long-term unemployed facing clear discrimination in the job market. Employers are less likely to call back applicants who have been out of work six months or longer; and some job postings explicitly tell the long-term unemployed to not bother applying.A Harris poll conducted in May 2016 found that about half of unemployed workers had not been interviewed for a job since 2014 or earlier; not surprisingly, the unemployed cited “being out of work too long” as their primary barrier to landing a new job. This strengthens the case for greater monetary and fiscal stimulus. For the unemployed, it’s always important to get jobs — but today it’s even more important, both for their sake and for ours.